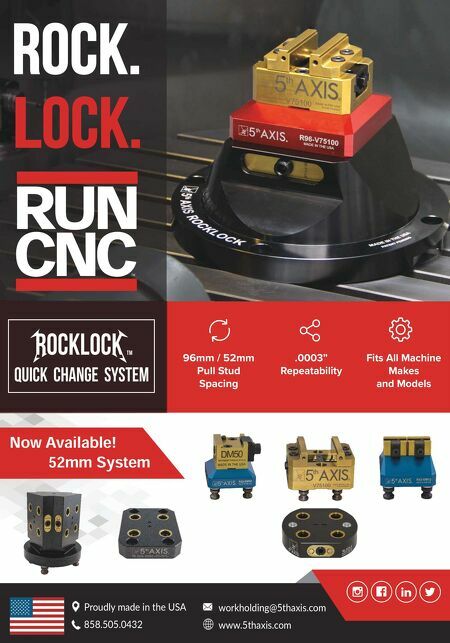 BETTER PRODUCTION MMS OCTOBER 2018 100 mmsonline.com AUTOMATION Multitasking CNC Machines Cut Down on Work in Process Instead of being concerned that CNC multitasking machines might be too cumbersome to set up and too difficult to program, MTH Tool Co. President Tim Tremain recognized their value in his shop's pump-manufacturing operations. In 1998, the company installed its first multitasking machine tool with a gantry robot, and Mr. Tremain hasn't looked back as the Plano, Illinois, shop has all but eliminated work in process (WIP), reduced the need for in-process workhandling and sig- nificantly increased its output without additional equipment or machining personnel, all while slashing job setup time, improving part tolerances and ensuring process consistency. Mr. Tremain's father started the company in 1965 in a garage. Today, MTH specializes COMPANY MTH Tool Co. 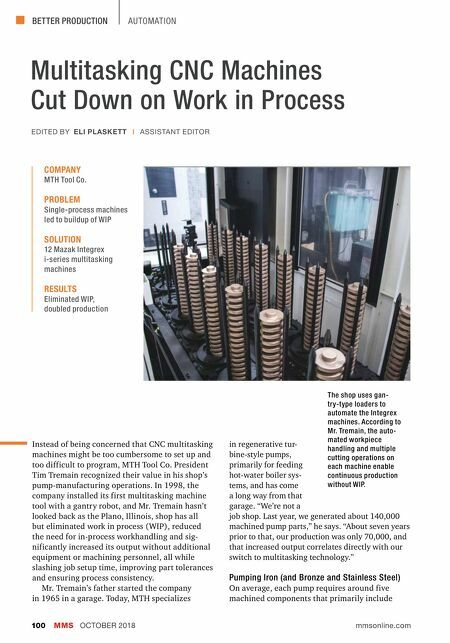 PROBLEM Single-process machines led to buildup of WIP SOLUTION 12 Mazak Integrex i-series multitasking machines RESULTS Eliminated WIP, doubled production EDITED BY ELI PLASKETT | ASSISTANT EDITOR in regenerative tur- bine-style pumps, primarily for feeding hot-water boiler sys- tems, and has come a long way from that garage. "We're not a job shop. Last year, we generated about 140,000 machined pump parts," he says. "About seven years prior to that, our production was only 70,000, and that increased output correlates directly with our switch to multitasking technology." Pumping Iron (and Bronze and Stainless Steel) On average, each pump requires around five machined components that primarily include The shop uses gan- try-type loaders to automate the Integrex machines. According to Mr. Tremain, the auto- mated workpiece handling and multiple cutting operations on each machine enable continuous production without WIP.